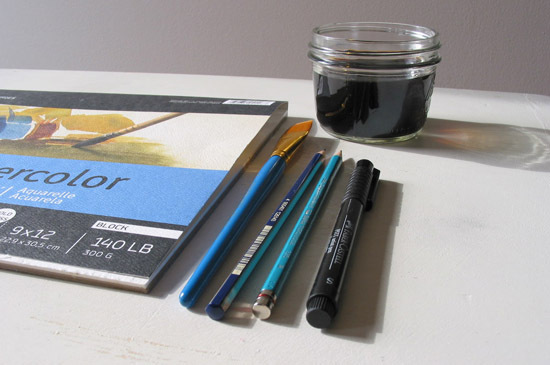 Watercolor BLOCK, paintbrush, artist pencils, archival pen, and coffee. Our next tutorial we loved and so did so many of our readers was this Art Tutorial by Mandy Behrens of weathered silo using kitchen colorants to make art. If you missed it, it's a fun process and cool little summer activity. Check it out below. 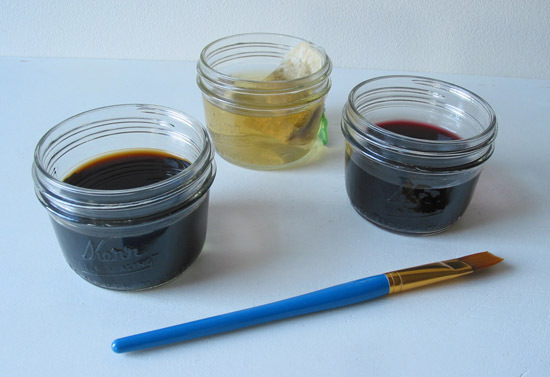 Art Tutorial: Drink Up These Kitchen Colorants! For me, one of the greatest pleasures of creating art is experimenting with unconventional materials. I learned this from my mom, my biggest artistic influence, who used coffee and tea to stain salvaged furniture. I fell in love with the hues cast upon ivory painted undercoatings and I marveled at the organic nature of the process--you never knew what the design would end up looking like until the colorants dried. A topcoat of varnish sealed the color! 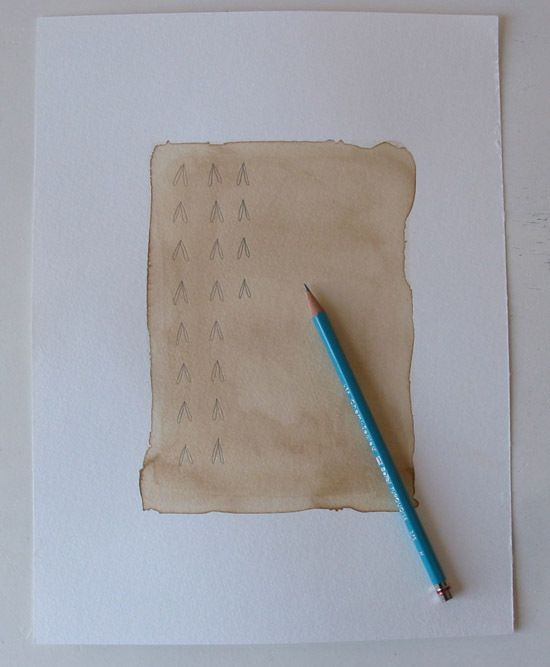 Today I'm applying this same staining technique to create one-of-a-kind pencil and ink drawings on heavy watercolor papers. I absolutely love the jagged edges and random "pools" of color this technique offers. 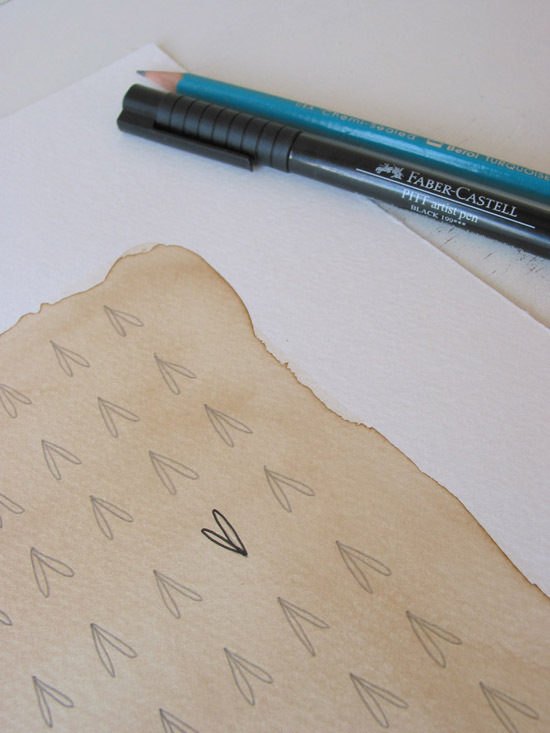 Follow along and see just how easy and rewarding this artistic technique can be! Pencil and ink applied to coffee-stained watercolor paper. 1. 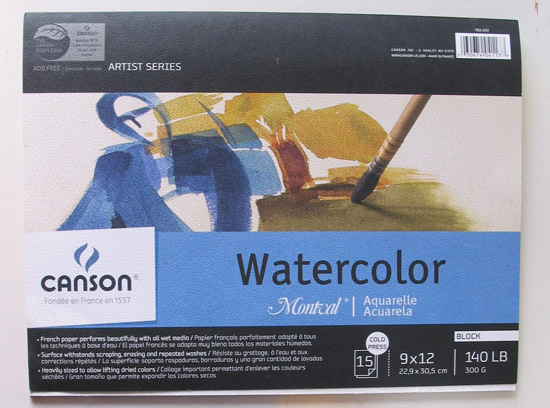 Choose a watercolor paper. This will depend on the design aesthetic you're going for. I prefer the heavier weighted papers (140 lb. or 300 lb.) because I love the way they feel and they can handle more manipulation (see "Etching" below). 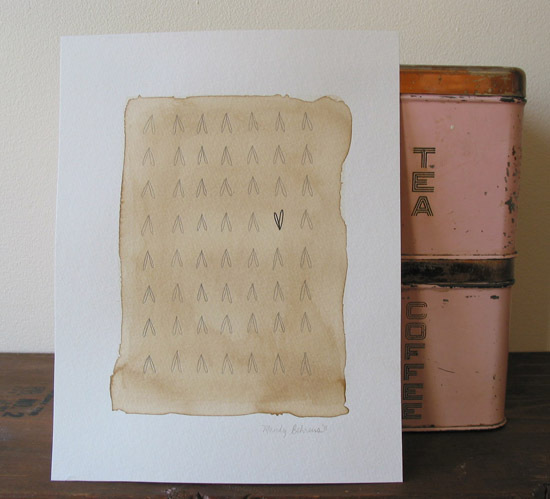 I also opt for Cold Press, a slightly textured surface, to trap the colorant in random patterns. It is hard to avoid even slight paper warping when working with watercolors, but I've recently discovered watercolor BLOCKs (stacks of papers glued on all four sides) that are a fantastic option and alternative to traditional watercolor paper stretching techniques. 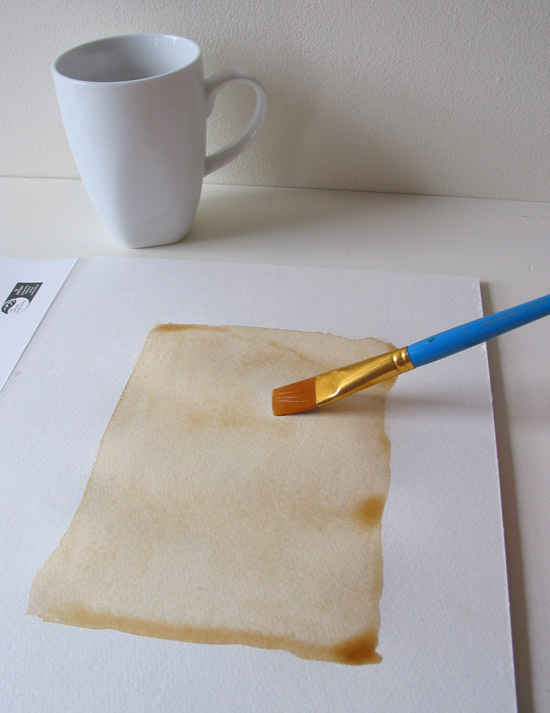 To minimize warping, leave your painting on the block until the colorants dry before removing. Experiment with coffee, tea, or wine. Apply colorants individually or combine to create a unique color. 2. Apply the colorant of your choice. This is my favorite part of the process! 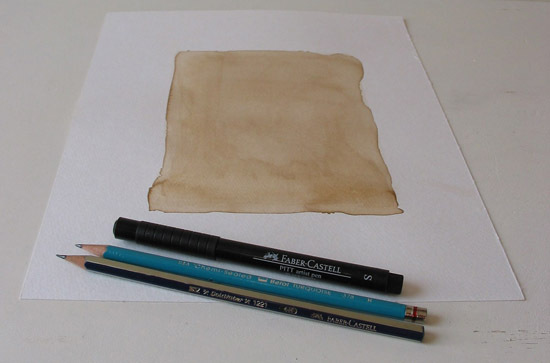 I begin by dipping my paintbrush in the colorant, in this case coffee, and outline the area I want to paint. I try very hard not to draw straight lines because I love the look of tattered edges. Applying the first wash of coffee -- intentionally leaving white borders. Next, I glide my brush across the paper being careful not to overwork the wash of colorant (very easy to do!) Try to resist the urge to apply additional washes of colorant until after the first application has dried because that is when you will see where additional splashes of colorant may or may not enhance your work. 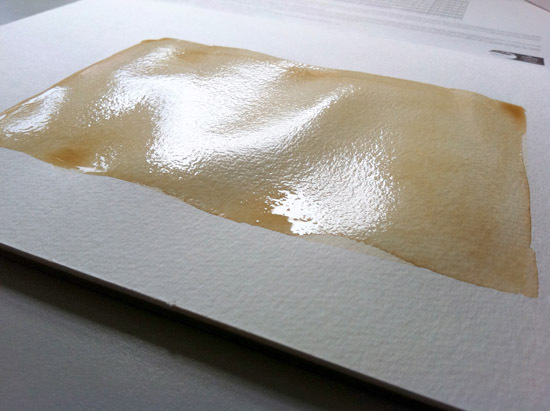 As expected, the watercolor BLOCK with colorant becomes slightly warped. Blotting: I find that some of my best outcomes are those where I've intentionally left some areas drier or lighter in color. 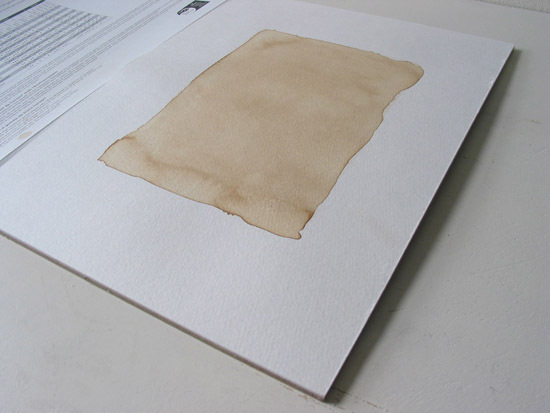 You can also achieve this effect by blotting your paper with a lint-free cloth. Leave stained paper on BLOCK until dry to avoid major warping. 3. Begin drawing your picture or pattern. My personal choice is to use a combination of pencils and archival inks to create my drawings, but you may prefer to use a combination of acrylics, gouache, oils, pastels, or calligraphy ink to complete your art--the possibilities are limitless! Artist pencils, archival pen and coffee-stained watercolor paper. I began with a pencil to sketch a pattern. I used an archival pen to highlight the single shape that's positioned differently. Etching: For added dimension, I sometimes scrape patterns onto the dried colorant area of my paper using an etching scribe. You can achieve the same look with a wooden bamboo skewer or other sharp artist's tool on hand. 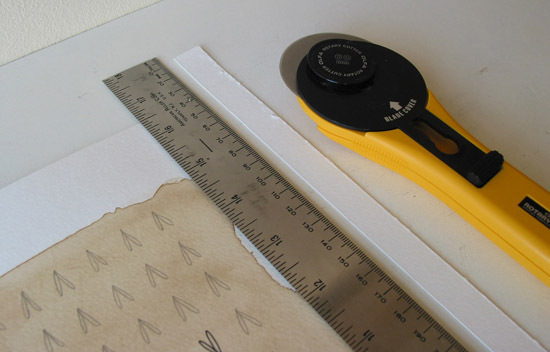 Unless you're going for a look that incorporates holes, I recommend practicing this technique on some scraps of paper first. 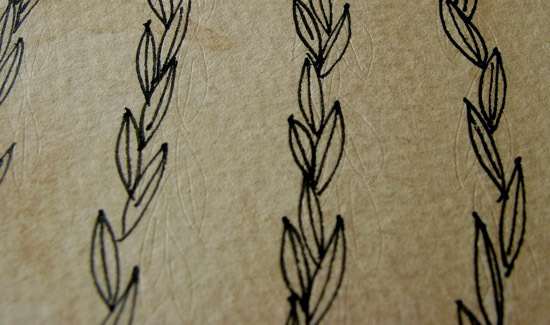 An example of etching on a different drawing: I scraped the same inked leaf design into the paper with an etching scribe. 4. Trimming and framing. The watercolor BLOCK paper I used was 9"x12" but I wanted to create a drawing that could be slipped into an 8"x10" frame for quick display. I used a ruler and a rotary wheel to trim the paper to 8"x10". 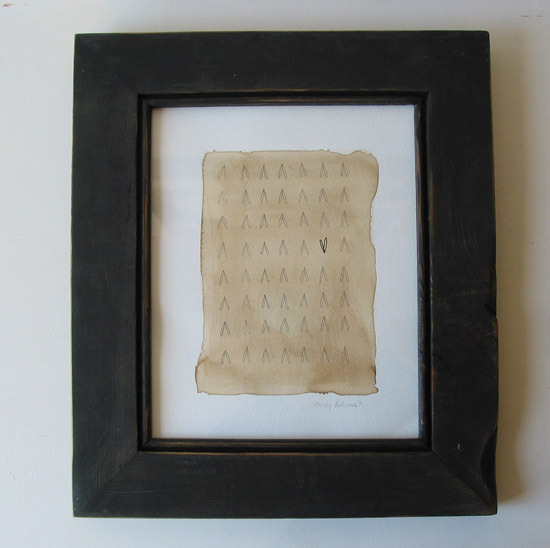 I recommend framing your artwork behind glass and avoiding displaying it in direct sunlight to avoid fading. I trimmed away excess paper using a ruler and rotary wheel cutter. Finished paper size is 8"x10"; image size is approximately 6"x8". Artwork with white borders fits nicely in an 8"x10" frame. Thanks for allowing me to share this technique with you. I can't wait to see what you create! You could make such a lovely series with these! Using different patterns or amounts of tea staining. I love your art cards so much that I added you to my weekly round up of arts and crafts around the web this week. With a link to your Etsy site.